Is Las Vegas kid friendly? This question is asked a lot, and the answer is always a resounding, “YES!” The self-proclaimed “Entertainment Capital of the World” is chock-full of things for children of all ages to see and do, and we’ve rounded up the very best of those things here. Keep scrolling for the lowdown on the 30 best kid-friendly activities in Las Vegas! The Summit, a 12-level tower that features interactive science experiments on each level. Tickets are $14.50, but those younger than one and older than 100 are always free. 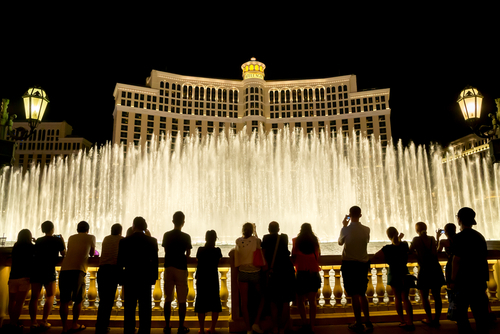 The fountains outside of the Bellagio hotel are world-famous; they’ve even appeared in movies such as Ocean’s 11. Every night, the 1,000 fountains “perform” an exhilarating show with music, multicolored lights, and choreographed dancing water. The whole family is sure to enjoy the spectacle. Shows are 15 minutes long and begin every half hour starting at 8 P.M. The show is free, but be sure to get there early for a good view! 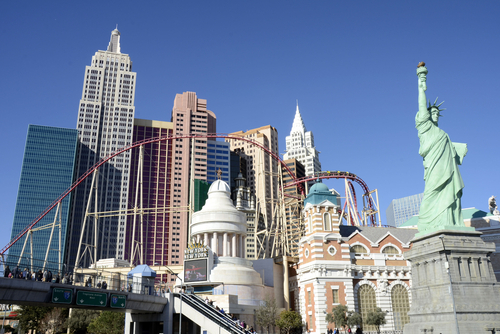 For a relatively small city, Las Vegas sure has a ton of theme parks and theme-park attractions. One of the best is the Adventuredome, a five-acre indoor park located just behind Circus Circus (look for the big pink tent!). Adventuredome caters to kids (and adults!) of all ages. No one will have trouble finding a ride or game that fits their age range and/or ability level. 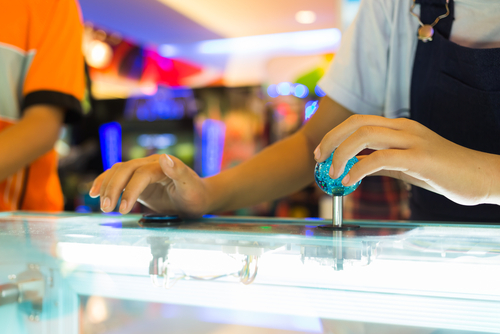 Roller coasters, arcade games, fair-type games, miniature golf, and a fun 4D movie are all options for entertainment. 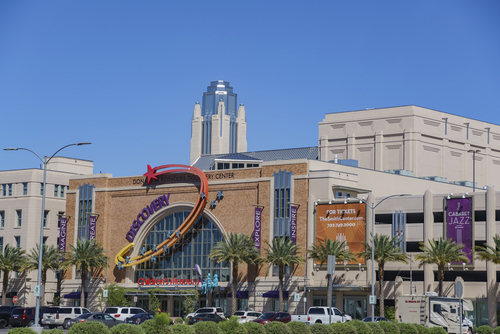 Admission to Adventuredome is free, however each game or ride costs money. Alternatively, an all-day ride pass is available for those looking to spend quite a bit of time here. 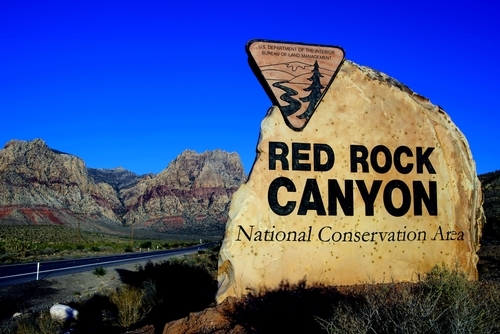 Located just 22 miles west of the Strip is beautiful Red Rock Canyon. This stunning feature of the vast Nevada desert has lots of great family-friendly offerings. A 13-mile scenic drive will take you through most of the major sights, though we recommend stopping at one of the 26 trails and climbing areas to truly experience the canyon. Trails range from easy to strenuous. Don’t forget to bring plenty of water to stay hydrated on whichever trail you choose. 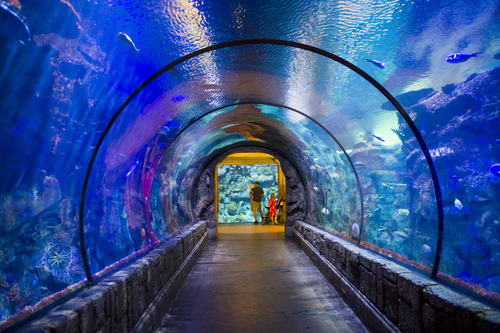 Get ready to enter a whole new [under]water world at the Shark Reef Aquarium at the Mandalay Bay hotel. The aquarium’s 14 exhibits feature exotic fish, sea turtles, rays, crocodiles, piranhas, and of course, lots of sharks. Walking through the tunnels of the 1.3 million-gallon shark tank is sure to be a thrill for any child, while slightly older kids will be fascinated by the hands-on Touch Pool. Regular admission to the Shark Reef Aquarium begins at $25. Who doesn’t love a real-life chocolate factory? Book a tour for you and your kids at the Ethel M Chocolate Factory located not too far from the Strip. The tour is interesting and visual. 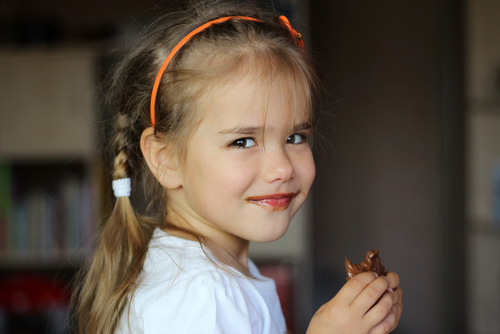 Children are sure to look forward to the end when the factory provides a free sample of their delicious chocolate. When you’re done with the tour, spend a little time in the Ethel M Botanical Cactus Garden. Both the garden and the chocolate factory tour are free. Las Vegas gets hot, especially during the summer. To cool down in a fun way, head about 15 minutes south of the Strip to Wet ’n’ Wild Water Park. 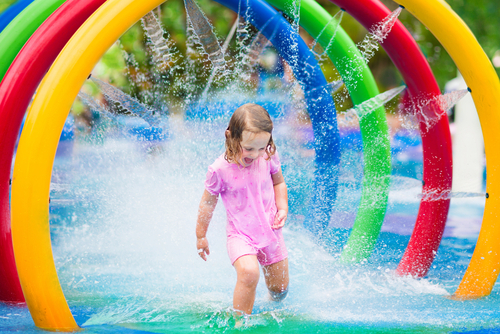 Boasting more than 25 different waterslides and other water attractions, Wet ’n’ Wild makes for a thrilling day for water-loving kids of all ages. Older children may revel in the six-story vertical drop slide that is Canyon Cliffs, while younger kiddos will be more than happy with the fountains and giant dumping bucket on kid-friendly Splash Island. The general admission price for a day at Wet ’n’ Wild is $39.99. Though technically located in the town of Henderson, the Lion Habitat Ranch is just a few minutes from the Las Vegas Strip. The Habitat opened to visitors in 2012, but has been taking in animals retired from Las Vegas shows since 1975. Today, 32 lions, a juvenile giraffe, and a bevy of other exotic animals call the Habitat home. Family members of all ages will love getting close to the beautiful animals. 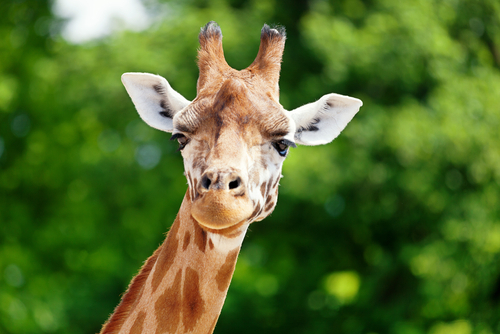 If you can, book a spot on a behind-the-scenes tour for the chance to feed the giraffe. Adult tickets are $25, with discounts offered for Vegas locals, seniors, first responders, military, college students, and hotel employees. The first child’s ticket is free with the purchase of an adult admission, while additional children’s tickets are $10. Okay, so it’s not Italy, but it’s certainly the next best thing! 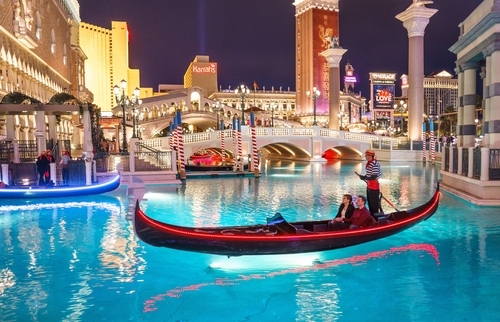 Head over to the stunning Venetian Hotel, where traditional Italian gondolas travel through a series of man-made canals remarkably designed to resemble the real thing. Over the course of the 15-minute ride, gondoliers in striped shirts serenade you with “That’s Amore” and other delightfully expected songs. Serenadees may choose between an indoor or outdoor route. Each gondola seats a maximum of four people. Tickets are $29 and must be purchased in person. It may be modeled after the London Eye in Great Britain, but the High Roller happens to be the tallest observation wheel in the world! 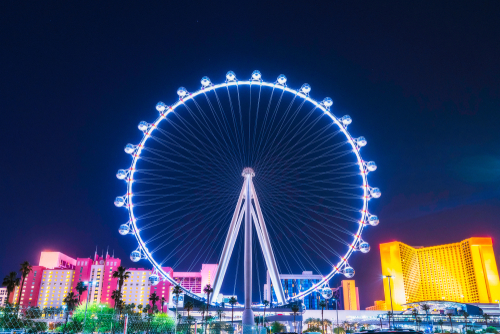 Towering 550 feet above Las Vegas Boulevard, the High Roller Observation Wheel allows visitors stunning 360-degree views of the entire city. Simply step onto your assigned glass-enclosed sphere and enjoy the leisurely, one-foot-per-second rotation. It is highly recommended that you book your 30-minute ride well in advance, as tickets — especially evening and night time tickets — do sell out. Tickets start at $20. Head to The Mirage hotel to get up close and personal with real-life dolphins and big cats. 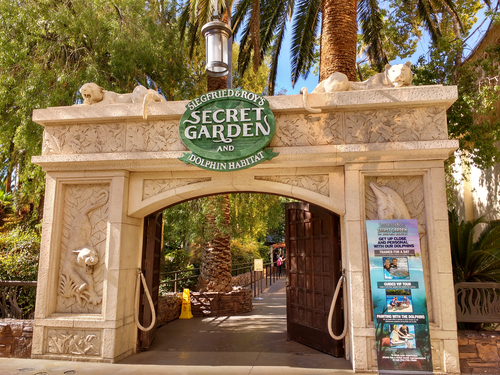 The Secret Garden is a lush paradise in which big cats such as tigers, lions, leopards, and panthers are housed. Not only can your kids awe over the beauty of these majestic creatures, they can also learn about them through the various information cards set up around the exhibit. Located near the cats is the 2.5 million-gallon Dolphin Habitat, where bottlenose dolphins live in peace and safety. Though there aren’t scheduled shows per se, there are certain times throughout the day when the dolphins can be seen interacting with their trainers. Tickets to see the animals start at $17, but check The Mirage’s website to see all of your experience options, including how to book a behind-the-scenes VIP tour, become a Trainer for a Day, or even paint with the dolphins. Las Vegas offers an incredible variety of shows and productions that are sure to appeal to families. 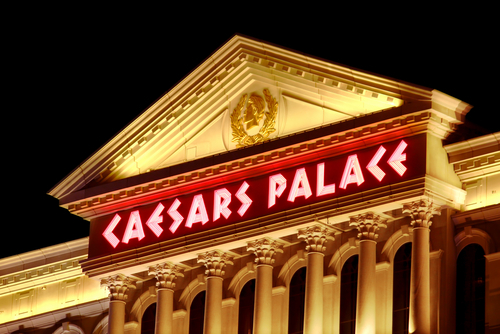 After all, Vegas is the “Entertainment Capital of the World!” Family-friendly shows include musicals straight from Broadway, magician acts, some comedy and variety shows, Cirque du Soleil, and the occasional celebrity headliner. Check with your local hotel or the Las Vegas tourism office on the Strip for current shows, honest recommendations, and ticket prices. You can’t do this one anywhere else in the world! 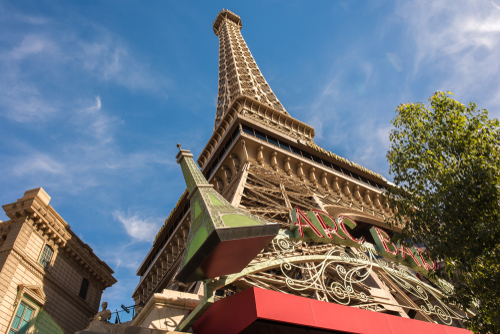 Oh wait. . . . Head on over to the Paris Las Vegas Hotel, where an incredible half-scale Eiffel Tower offers incredible 360-degree views of the Strip to visitors of all ages. The Eiffel Tower is open throughout the day, but if your schedule allows for it, consider reserving your tickets for the evening, when the city lights are truly something to behold. Tickets start at $10. Kids age three and under are free. Las Vegas may be a favorite hangout for celebrities, but the only guaranteed Hollywood sighting is at Madame Tussauds. Located near the entrance to The Venetian, this world-famous museum features celebrity wax figures that are remarkably lifelike. The whole family is sure to enjoy wandering through the various themed rooms to see their favorite stars from music, movies, and television. There are even a few Las Vegas legends in residence! The museum is hands-on, so feel free to step on stage with the Rat Pack for the ultimate Instagram shot! Tickets start at $22, but kids under two are free. Since you have to eat, why not make your meal an experience at the Rainforest Cafe? 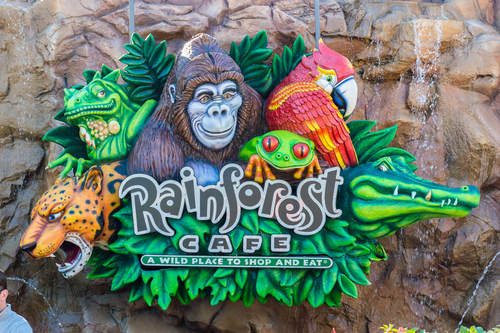 Located right on the Strip, the Rainforest Cafe features a wild menu with lots of options for both kids and adults. While you’re eating, don’t forget to look around — and above — at the various animatronic trees and animals that contribute to the feeling that you’re in a real-live rainforest. The periodic “darkening” of the room and clap of thunder that signal the incoming “storm” are always a thrill. Perhaps best of all, a percentage of each meal purchased at the Rainforest Cafe goes to help save the actual rain forest. 16. Enter the Marvel Universe at the Marvel Avengers S.T.A.T.I.O.N. Your superhero-obsessed family members won’t want to leave Vegas without experiencing the out-of-this-world Marvel Avengers S.T.A.T.I.O.N. Lots of props and costumes used in the movies are on display here, including Thor’s hammer, some of Iron Man’s armor suits (check out that Hulkbuster! ), Captain America’s shield, and Ant-Man’s helmet, to name just a few. The S.T.A.T.I.O.N. 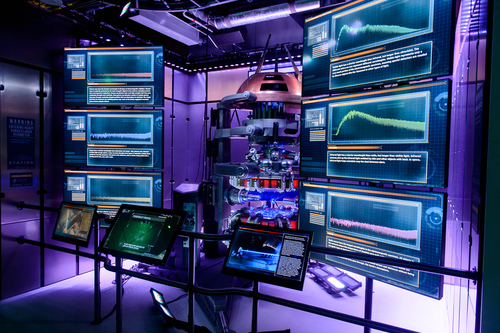 is also fully immersive, with hands-on activities that allow kids and adults to participate in recruitment and training as an official Avenger, test their Marvel knowledge and face off against Ultron. You can even take a ride on Captain America’s motorcycle. Tickets start at $32, and children under age four are free. Where else but Las Vegas can you see a volcano erupt in the middle of a major city? 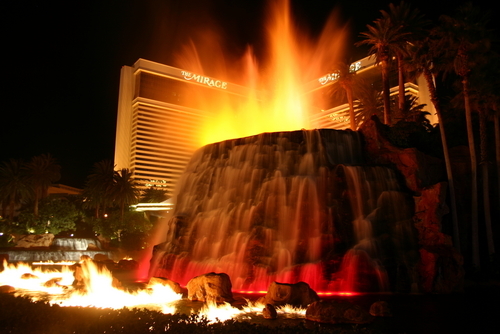 Every night at 8:00 P.M. and 9:00 P.M., the Mirage Hotel puts on its volcano show and erupts a volcano complete with fire, smoke, and booming sound effects! The show is totally free, but we recommend getting there early to ensure you don’t miss the main event. One of Las Vegas’s oldest and most classic hotels is The Flamingo. 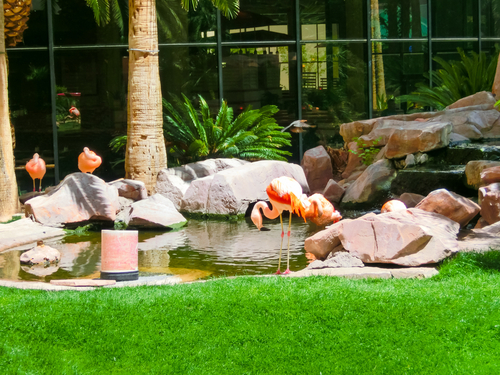 Head here to enjoy the Flamingo Wildlife Habitat, an exhibit featuring turtles, koi fish, parrots and other exotic birds, and of course, the signature pink flamingos living amongst waterfalls, ponds, and lush foliage. The Flamingo Wildlife Habitat is open until dusk each day, and is free to enter and enjoy. Check The Flamingo’s website or ask the concierge about the schedule for each day’s two live feedings. Circus Circus Last Vegas Hotel is a popular accommodation choice for families visiting Las Vegas, but you don’t have to be a hotel guest to enjoy all of the fun Circus Circus has to offer. The hotel’s resident circus performs a variety of acts each day beginning at 11 A.M. 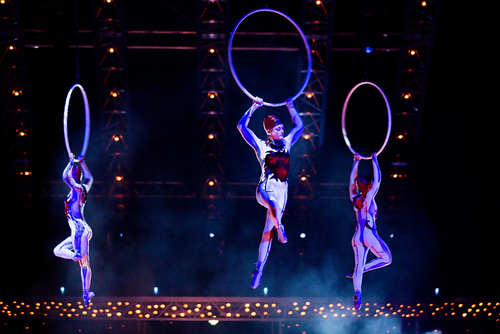 Kids of all ages will feel a part of the action as they enjoy watching the trapeze artists, juggling acts, aerial silk dancers, clowns, and much more. Circus Circus’s circus also offers a fun Carnival Midway, with carnival-type games suitable for all ages. Viewing the circus acts are free, though the carnival games do cost money. Older kids who enjoy the thrill of a roller coaster are sure to have a blast at New York, New York. This — you guessed it — New York-themed hotel is home to the Big Apple Coaster, a fun ride that begins with a 144 drop before speeding around a track at 67 mph and ultimately ending with a loop and 180-degree twist. 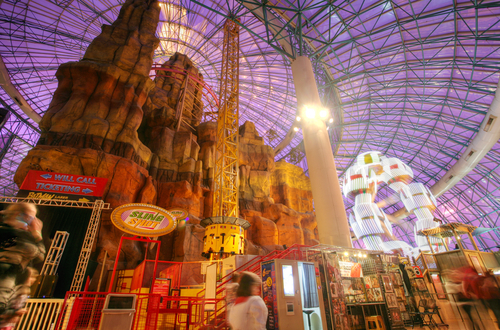 Though there are age and height requirements for the coaster itself, younger kids can find plenty to do in the arcade. 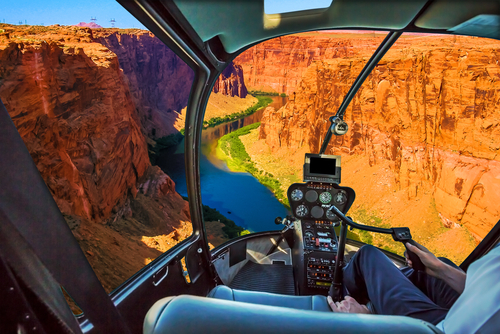 For those with the time and budget, a helicopter tour from Las Vegas to the Grand Canyon and back tops many Las Vegas Bucket Lists. Tours leave from the Las Vegas airport, then soar over the Mojave Desert, Hoover Dam, and Lake Mead before arriving at the world-famous Grand Canyon. Tours range from half-day excursions to full-day getaways, and some tour options include a short hike or a picnic stop in the Canyon. Check out Vegas.com or the tourism office on the Strip for all of the options available. You’ll have to take a short taxi or Uber ride to get there, but Las Vegas’s Topgolf facility provides great fun for family members of all ages. 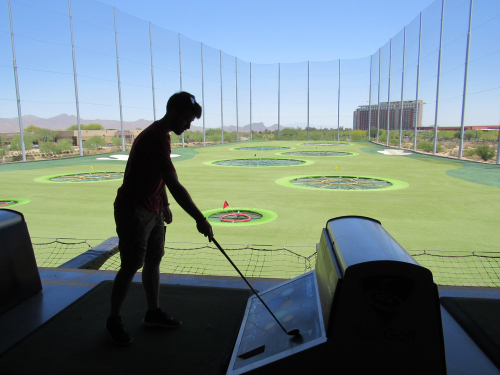 Like its other popular locations around the country, Topgolf Las Vegas consists of a driving range with a twist. Groups rent out their private bay, then take turns using their provided clubs to hit microchipped golf balls at various targets. Hit a target and your personal scoreboard is automatically updated. Besides golfing, Topgolf offers live entertainment, massive TV screens for enjoying the big game, corn hole games, shuffleboard, and even two pools. Las Vegas is full of kid-friendly activities, but few of those things are truly educational. 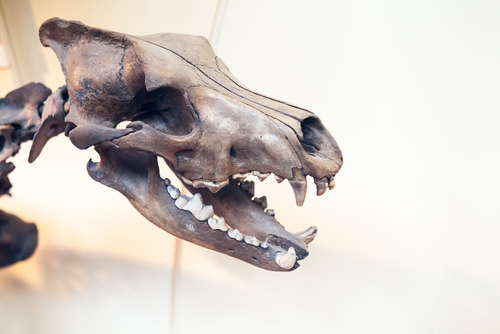 One notable exception is the excellent Natural History Museum. As an affiliate of the Smithsonian, this museum is full of fascinating exhibits that are sure to delight — and educate — kids and adults alike. Don’t miss the Treasures of Egypt exhibit with its myriad Egyptian artifacts and replica of Tutankhamun’s tomb. The Prehistoric Life exhibit is another hit, while the Marine Life Gallery Hall includes live fish, rays, and even sharks. Check out the times in advance for the shark feedings! There are even quite a few hands-on activities for younger kids. Tickets are $6 for children (kids two and under are free) and $12 for adults. Located on the Strip near the MGM Grand is the incredible M&M’s World. 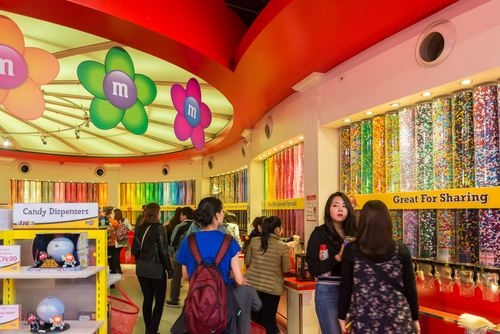 Kids will have a blast exploring this four-story mecca for all things M&Ms. Grab some gifts or souvenirs from the selection of M&M-themed mugs, t-shirts, office supplies, and stuffed animals, then make your way upstairs to personalize your own M&Ms by choosing from hundreds of different candy colors. Entering the store is of course free, and the experience is sure to win over even the family member with the least sweet tooth. Much safer than jumping from an actual airplane, indoor skydiving at Las Vegas Indoor Skydiving is a blast for both kids and adults. Participants take part in a short training session before strapping into their provided suit (which includes a helmet and safety goggles). Flying sessions last about 15 minutes, but if that’s not enough, a discount is offered for a second session. Flights start at $75. 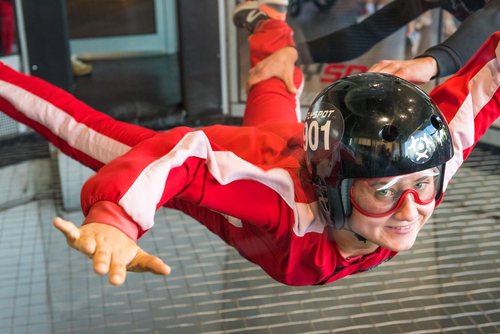 Be sure to check Las Vegas Indoor Skydiving’s official website for details regarding weight minimums and maximums. 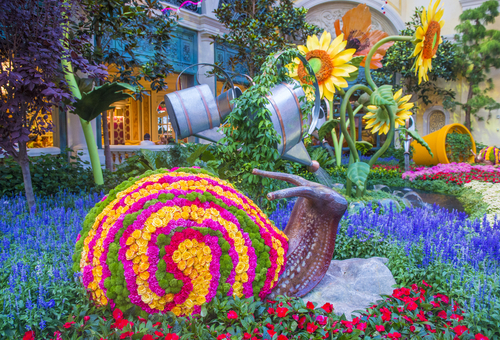 Your kids will feel as if they’ve stepped into Wonderland on a visit to the Bellagio’s Conservatory & Botanical Garden. Located just past the lobby and underneath a massive glass dome, the Conservatory & Botanical Garden features thousands of flowers, plants, trees arranged into beautiful scenes by 120 skilled horticulturalists. Talk about a great place for photos! The scenes change each season to ensure one never experiences the same garden twice. The Conservatory & Botanical Garden is open to the public 24 hours a day, and is free to enter. The Camelot-inspired Excalibur hotel puts on a nightly show that you won’t want to miss! 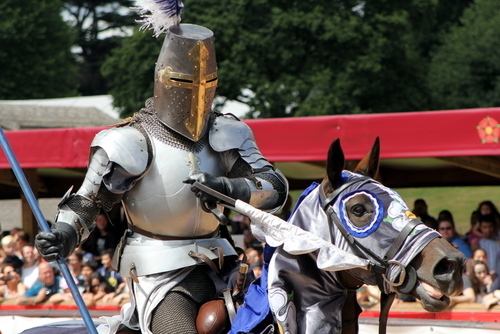 The Tournament of Kings is a carefully choreographed and wildly entertaining medieval jousting show. Each seating section has its own knight and horse to cheer on throughout the event. 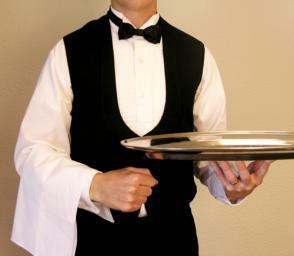 Best of all, an entire three-course meal is served — though you’ll have to eat it all with your hands (you know, like peasants!). Kids under three are free but must share their seat and meal. Other tickets start at $56. Fremont Street is an awesome alternative to the busy Strip. Plus, it’s home to Slotzilla, an epic ziplining experience open to anyone weighing a minimum of 50 pounds. 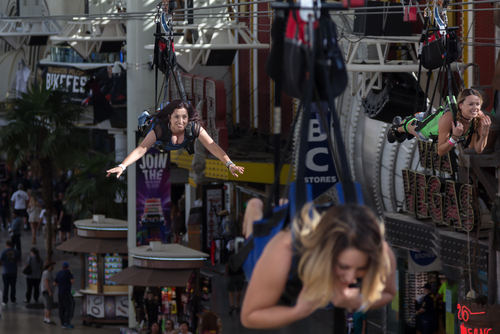 After being safely harnessed, zipliners fly out of a giant, 12-story replica slot machine before sailing Superman-style past the neon lights of some of Vegas’s most classic casinos. Tickets are $20 or $40, depending on your chosen experience. Located just off the Strip is the Pinball Hall of Fame, a non-profit museum of sorts that consists of row after row of fully restored, working pinball machines and other vintage arcade games. More than 200 games are available at the Hall of Fame, most of which cost anywhere from 25 cents to $1 to play. While you’re exploring Caesar’s Palace, be sure to stop by the forum shops for the “Fall of Atlantis” show. The story is a little silly, and might go over a very young child’s head, but this free 11-minute show is surprisingly entertaining, and features animatronic statues and some pretty impressive special effects.